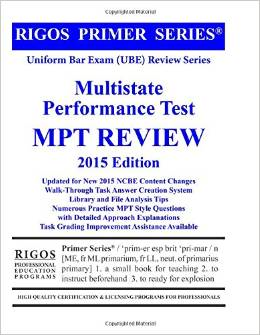 The Rigos Bar Review Series Multistate Performance Test (MPT) textbook is all you need to pass the MPT administered by the National Conference of Bar Examiners (NCBE). Please begin by carefully reading the introductory chapter. It contains valuable information about the MPT exam and insights into the question characteristics of the tasks. This book includes succinct explanations of the most frequently tested MPT tasks and contains only the information you need to pass the MPT portion of the exam. The “Tips and Traps” section helps familiarize you with typical distracters used by the examiners to confuse the Performance Test exam-takers. This book provides advice on the best approach, time scheduling, and format for answering each of the four types of MPT questions. This helps strengthen your abilities to research and organize both the file and library, and helps focus your answers efficiently. Also included is ten simulated exam questions categorized by topic with full sample answers to help you gauge your progress and teach a MPT task answer creation process.